My first sponsor and a funky bag! I have my first sponsor! 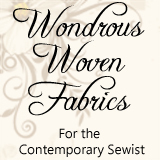 I’m delighted to introduce you to Wondrous Woven Fabrics. Cathy who runs the store says she tries to offer “popular lines and those that are more unique and maybe not as well known so you might discover something new”. Cathy also has an interesting blog called Wondrous Woven Magic so check it out while you’re there too. If you’d like to advertise or sponsor me please contact me here. I came across Larissa’s blog mmmcrafts the other day and she had this lovely Messenger Bag pattern including instructions on how to make it and she’s given me permission to show it to you. Isn’t it funky? I’m hoping to be able to show you a new project tomorrow. I started it yesterday but haven’t had the time to take some photos yet. Hopefully I’ll get to take some nice ones and then I can share them with you.